BONES REDS were developed to be an affordable alternative to Bones Swiss. They feature ground and superfinished chromium steel balls and races, a high speed, removable nylon ball retainer, Bones Speed Cream lubricant and a removable, non-contact, frictionless red rubber shield. 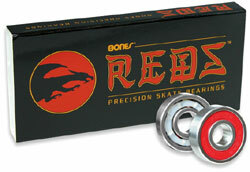 This combination of Skate Rated™ design, quality components and careful quality control makes them faster, smoother and longer lasting than other skateboard bearings in their price range, so let the good times roll with Bones REDS.